The 12 boys who were rescued after being trapped in a flooded cave in Thailand for more than two weeks played a friendly match on Sunday after being invited to Argentina for the Youth Olympics. The Wild Boars team, aged between 11 and 16, are the honoured guests at the Youth Olympics in Buenos Aires after their rescue gripped the world. They arrived on Friday for the Youth Olympic Games, which are taking place from October 6 to 18 in the Argentine capital. On Sunday, the team played a friendly match against the River Plate youth soccer team of Argentina. The Thai youngsters, accompanied by the coach who took them on their trip to the Thuam Luang cave complex, were given a guard of honour by their Argentinian counterparts as they took to the pitch. 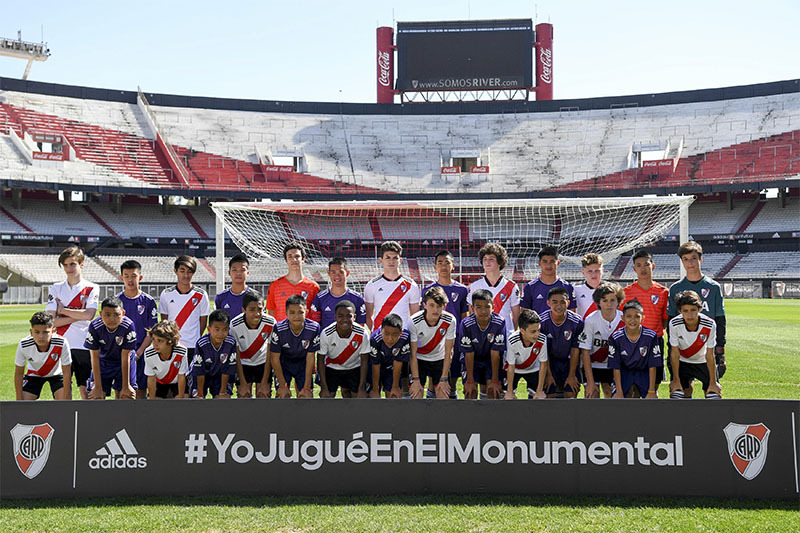 Dressed in violet jerseys with the team logo of the record Argentine champions, they faced River’s under-13 team, entering the pitch to loud applause from their opponents. The friendly was played at the Estadio Monumental, which hosted the 1978 World Cup final, and finished in a 3-3 draw. ‘The kids are very happy to be here, very excited,’ said Werachon Sukondhapatipak, head of the Thai delegation. ‘It is something important to be there to discover the Youth Olympics and to show their appreciation to the world. The team were greeted by Rodolfo D’Onofrio, president of River Plate. ‘It’s really a spectacular moment because these boys have lived really terrible moments,’ D’Onofrio said. ‘We are very happy to receive them to play a one-hour football game. ‘We offered them the complete equipment… today they were players of River Plate’. ‘The kids are very happy to be here, very excited,’ said the head of the Thai delegation Werachon Sukondhapatipak. The plight of the Thai boys attracted global media coverage and an international rescue effort after they became trapped in a cave. The boys and their 25-year-old coach, Ekapol Chanthawong, had been exploring Chiang Rai’s Tham Luang cave on June 23 when they became trapped. They survived nine days on water dripping from rocks before they were discovered on a muddy mound by divers. They were found by two British divers and brought out in a daring rescue mission that ended on July 10. The rescue effort claimed the life of one volunteer diver, former Thai Navy SEAL Saman Kuman. They have since been showered with invitations, among them to fly to the Argentine capital and attend the Youth Olympics. The boys, who were also guests of honour at the Games opening ceremony in Buenos Aires on Saturday, will leave on Tuesday.